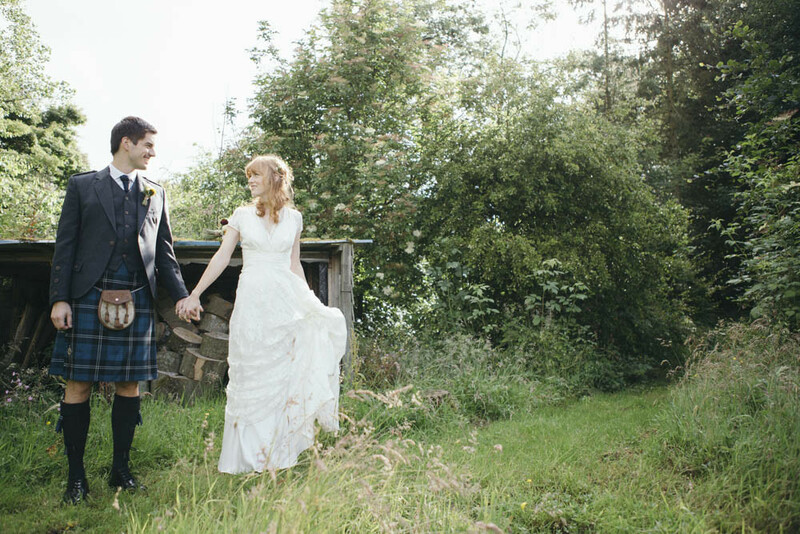 This wedding is just brimming with rustic Scottish loveliness and I love it! 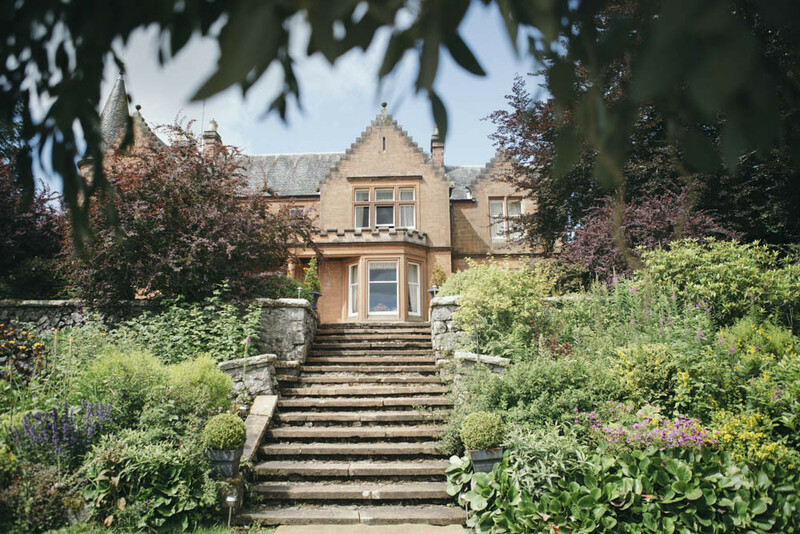 Kate and Andy planned their big day from their home in LA, so finding a venue they could inhabit for the whole weekend was really important – Toftcombs Mansion, set in 10 acres of rolling Scottish countryside, was the perfect place to escape to for a few days of fun with their friends and family. 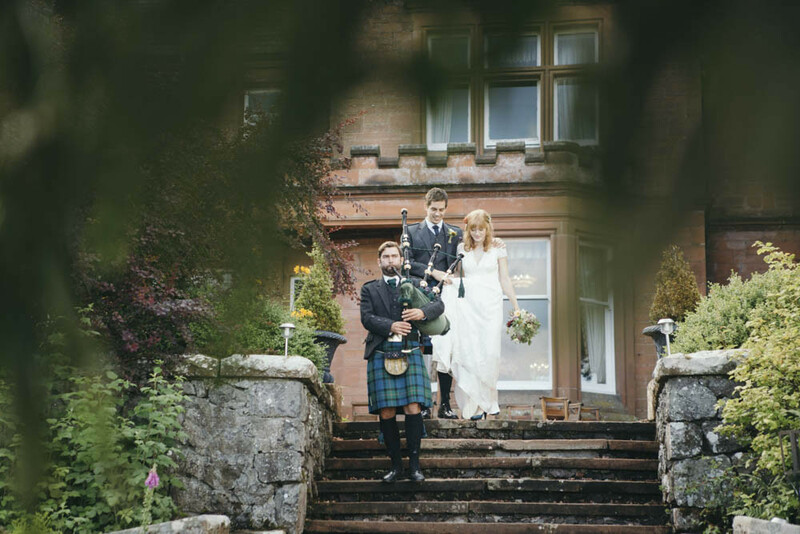 The couple held their ceremony in the well of the gorgeous double story hallway in the house, which made for some lovely photographs, and meant that guests could look down from above, as well as being seated around the couple. 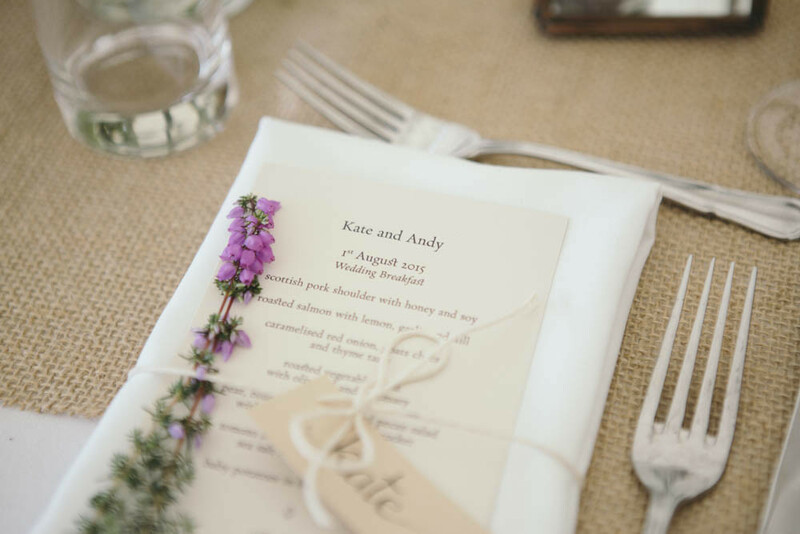 There’s an abundance of wild flowers, a dessert table that looks like it should belong at some sort of woodland fairy feast, a whisky bar filled with vintage drafts, Kate’s vintage dress is stunning and the Bridesmaids look gorgeous in lace dresses in tonal shades of blue. 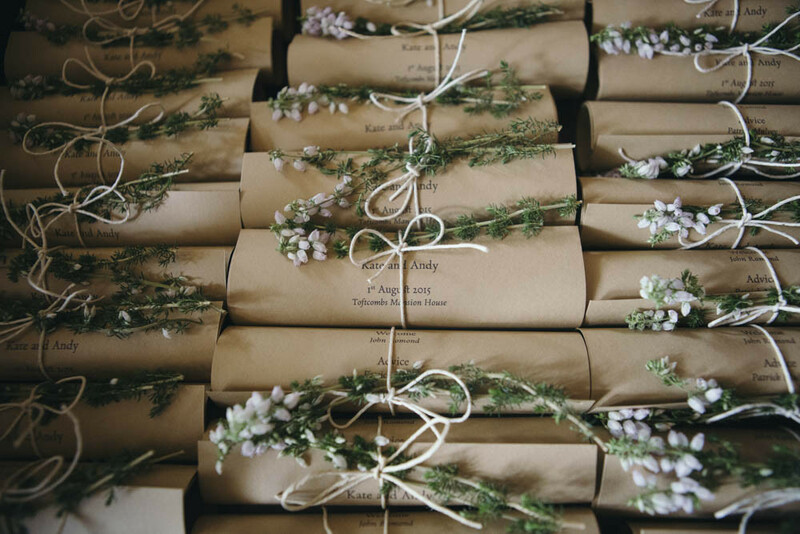 Are you ready to be transported to rustic wedding heaven? We live in Los Angeles and Kate shopped around the alternative boutique’s in L.A’s Echo Park, Silverlake and downtown. She found what she wanted at Shareen’s in the arts district. Kate wanted lace, sleeves and a simple, classic look. Andy wore the Ramsay tartan kilt he got for his 21st bday. We wanted to find somewhere that we could have the wedding but also somewhere that could house our closest friends and family for the weekend (because so many were traveling from the States). Toftcombs was perfect. 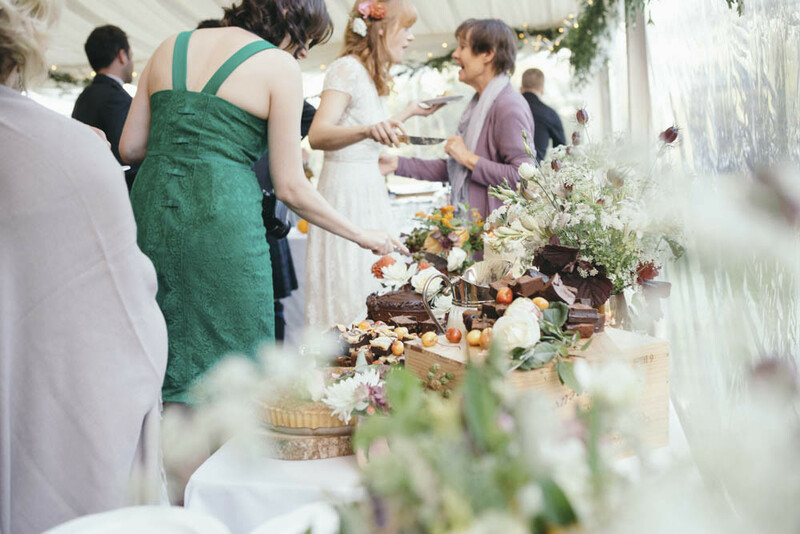 It gave us the chance to spend a lot of time with everyone, not only on the wedding day itself, but the whole weekend. We had a themed quiz, a football match etc. We were able to pitch a tent on the grounds. We had the ceremony inside and then went over to the tent for dinner, drinks and dancing. 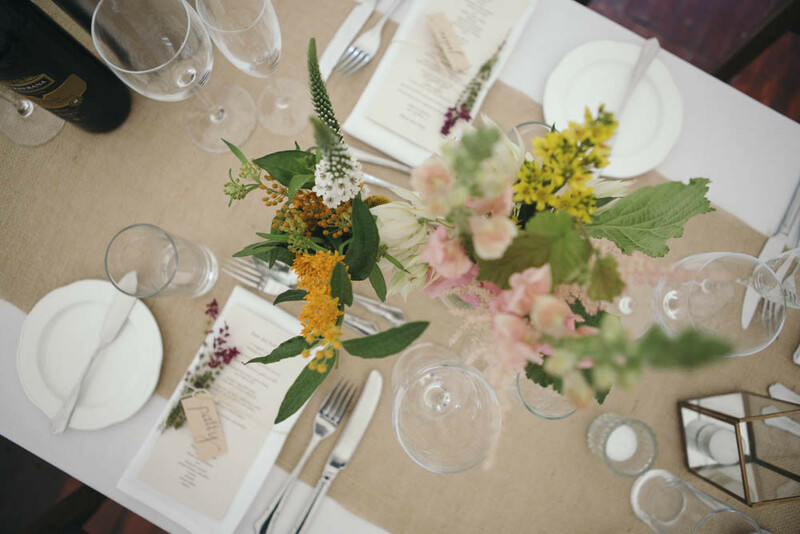 We wanted really warm, lush, vibrant flowers and colours. We wanted something natural and comfortable with a garden feel. 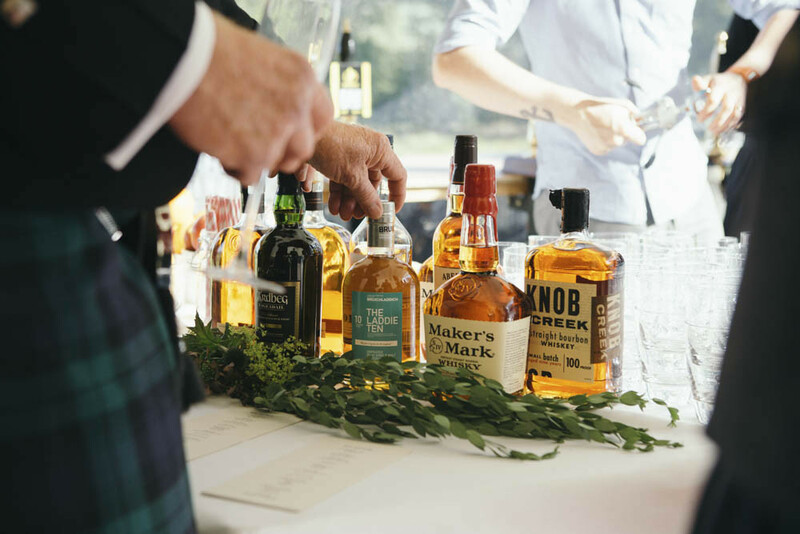 We wanted the wedding party to have a kind of relaxed feel. Men free to pick their own tartan but tried to have similar jackets. 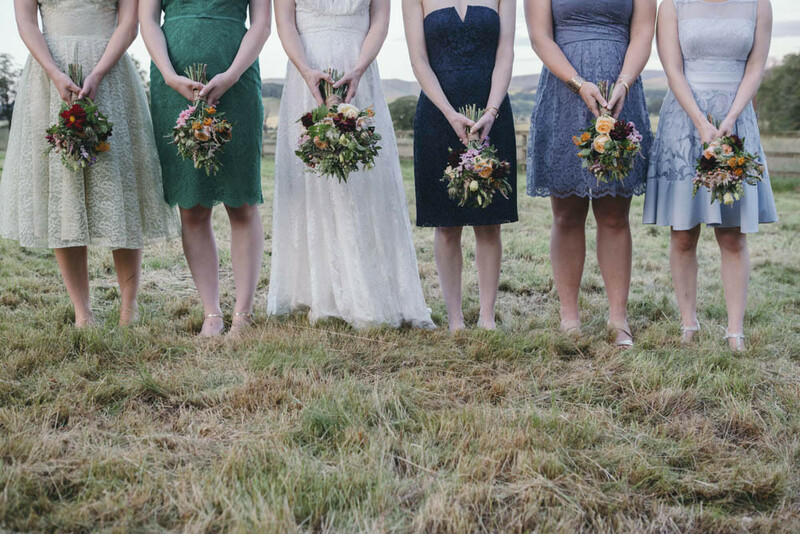 Ladies were given a colour palette of blues and greens, cooler colours to contrast with the warmer flowers. We wanted to have the ceremony be as personal as possible. We were technically already married so nothing about it had to be ‘official’. John, Kate’s brother, officiated, Andy’s dad, Angus, (a violinist) played, Kate’s dad, Ed, recited a poem written by her mom, Jan. Andy’s sister, Fiona, and her boyfriend (who is also a musician), Rick, played a couple of songs. We wrote our own vows. The wedding party and John then surprised us by John reading out messages of support from our wedding party as we prepared to give each other our vows. And then we kissed! My dad knew the ceilidh band so they very kindly introduced our American friends to this Scottish practice. After that, we danced the night away to all sorts of tunes. We didn’t get into trouble with a neighbour for having danced for too long. The food was amazing! The cakes and main meal were just perfect. We just wanted everything to be tasty and it really, really was. Sequoia and Lauren’s photos are amazing. 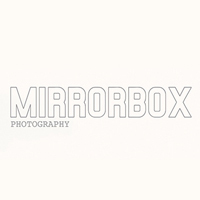 We really wanted Mirrorbox to capture the more candid moments of the day and we are so thrilled with the results! 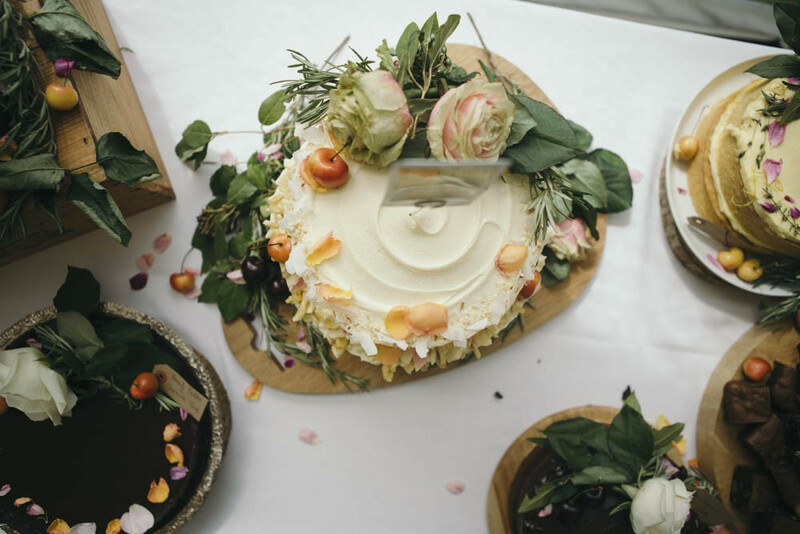 The cakes look absolutely delicious… And the ‘garden feel’ flowers are so beautiful. Gorgeous.